“When evening comes, you say, ‘It will be fair weather, for the sky is red,’ and in the morning, ‘Today it will be stormy, for the sky is red and overcast.’ You know how to interpret the appearance of the sky, but you cannot interpret the signs of the times. A wicked and adulterous generation looks for a sign, but none will be given it except the sign of Jonah.” Jesus then left them and went away. If Jesus had a website “Can you show us a sign from Heaven?” would be listed in his FAQs. 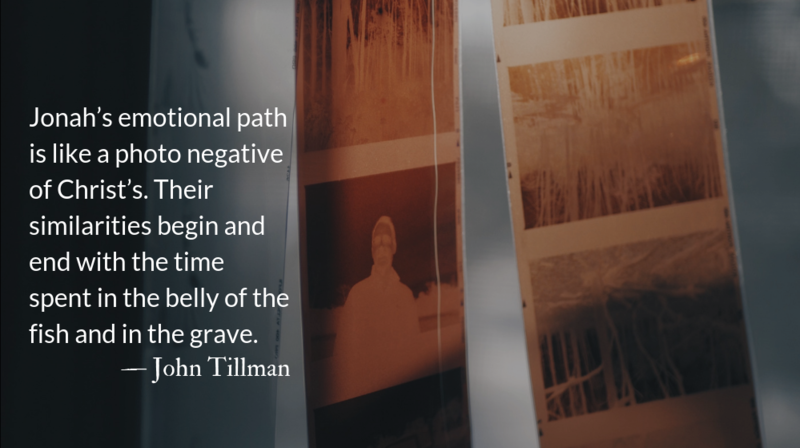 Jonah’s emotional path is like a photo negative of Christ’s. Jonah went to Nineveh unwillingly. It was not because he was afraid for his life, as many prophets were. He did not want to save the Ninevites because they were dangerous enemies of Israel. He was willing to die to save the idol-worshiping sailors in the boat, but when Nineveh repented and wasn’t destroyed, Jonah pouted like a child for the destruction of his enemies. Jesus is, indeed, “greater than Jonah,” as he claims in Matthew 12. Their similarities begin and end with the time spent in the belly of the fish and in the grave. Jesus left Heaven, setting aside his glory willingly. Jesus’ desire was consistently to seek and save the outcast and the lost. He demonstrated his love for sinners because he was willing to die for us. When the unrepentant beat, stripped, and crucified Christ, he cried to his Father for the forgiveness of his tormentors. The signs of scripture, like the signs of the sky Jesus references, are clear and we can read them. Like the religious leaders, who privately acknowledged Christ’s miracles, we fail to follow Christ not because we can’t read the signs but because we doubt what they say. We question. We qualify. We delay. Jesus tires. He sighs. He weeps. Jesus, in frustration, “walked away” from the religious leaders. But that is only because they didn’t go with him. When Jesus walks away from us, it isn’t to abandon us. He intends us to follow him. One of the key differences between the religious leaders and the disciples is that the disciples took their questions and doubts with them, following Jesus anyway. We can bring our doubts, but we must be willing to take up our cross. There is no other way to follow him. – Prayer from The Divine Hours: Prayers for Autumn and Wintertime by Phyllis Tickle. Christ’s message of reinstatement is for all of us. He doesn’t see our failures as the world sees them. Christ sees more failure in us than even we know, yet he re-calls us—he calls us to himself again, and again, and again. Christ re-calls the failures.